As if it’s not hard enough to keep up with the Infinity Stones and Hydra secrets of the Marvel Cinematic Universe, there are now some slightly confusing updates about the TV side of the MCU as well. One of the breakout characters of Marvel’s flagship TV show Agents Of S.H.I.E.L.D. is Barbara “Bobbi” Morse, a.k.a. 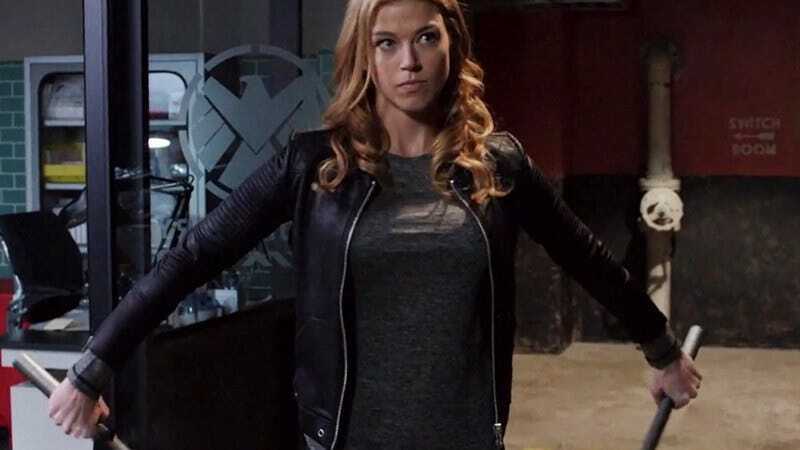 Mockingbird (Adrianne Palicki), a kickass operative who wields cool ninja sticks and has quickly established herself as one of the best female characters in the MCU. Earlier we reported that Palicki was set to star in her own S.H.I.E.L.D. spinoff series alongside Nick Blood, who plays Bobbi’s ex-husband and fellow spy Lance Hunter. Now, however, Deadline is reporting ABC has put the brakes on that spinoff. Since the network renewed Agents Of S.H.I.E.L.D. for a third season, Deadline theorizes it may be nervous about poaching two popular characters from the series, which has struggled to garner the same fan enthusiasm as other Marvel properties. It seems likely that Palicki and Blood will both stick around S.H.I.E.L.D. for the foreseeable future, where they can continue to add some much-needed chemistry and cool fight choreography to the series. Although the latter half of the second season established Mockingbird as a more crucial player at S.H.I.E.L.D.—presumably as setup for the spinoff—the series changes focus so frequently it shouldn’t be too much of a problem to keep her around. And Hunter basically does whatever she does, so that shouldn’t be a problem either. While one spinoff was axed, ABC and Marvel are reportedly still working on a secret TV project with American Crime creator John Ridley. That’s in addition to Marvel’s newly-announced second season of Agent Carter, the next three Netflix “Defenders” shows, and another season of Daredevil.